Flow cytometric analysis of HeLa cells (blue) and HUVEC cells (green) using VE-Cadherin (D87F2) XP® Rabbit mAb (PE Conjugate). 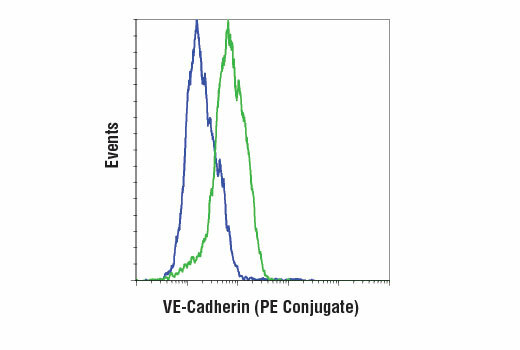 VE-Cadherin (D87F2) XP® Rabbit mAb (PE Conjugate) recognizes endogenous levels of total VE-cadherin protein. The antibody does not cross-react with other cadherin family proteins. Monoclonal antibody is produced by immunizing animals with a synthetic peptide corresponding to residues near the carboxy terminus of human VE-cadherin protein. This Cell Signaling Technology antibody is conjugated to phycoerythrin (PE) and tested in-house for direct flow cytometry analysis in human cells. This antibody is expected to exhibit the same species cross-reactivity as the unconjugated VE-Cadherin (D87F2) XP® Rabbit mAb #2500.